Oil on canvas, 76 x 84 cm. 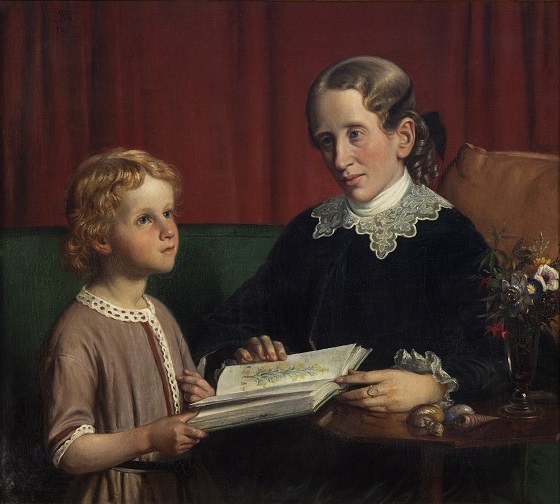 The close connection between aunt and nephew is the main theme in this family portrait of Annette and Hother Hage. The aunt has sat down in the green sofa to show her nephew a botany book. The child is looking away from the book, appearing thoughtful and curious. Annette Hage’s warm smile and facial expression indicates a deep devotion to her well-behaved nephew. Marstrand liked to depict intimate and unpretentious situations from everyday life in his family portraits. Such settings allowed for the strong family bonds and home-like cosiness to be emphasised in a casual and meaningful way. In this fashion, the artist’s family portraits differed significantly from the earlier Danish Golden Age painters’ staged family portraits such as Eckerberg’s group portrait The Nathanson family from 1818, which can be seen at the National Gallery of Denmark.